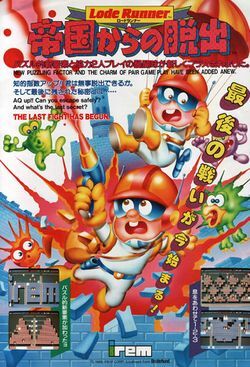 In 1986, Irem released their fourth and final arcade conversions of Lode Runner. Like the previous two, it contained 30 selected levels from the 150 original levels. However, it is the only version to contain a new mode of play: two player cooperative. In this mode, two players must work together to capture every gold ingot in 18 stages, some of which cannot be reached without a pair of players working together to achieve their goal. This is the only version out of Irem's four arcade releases that was not translated into English and sold directly to the American market. This page was last edited on 28 October 2013, at 17:20.